We love creating a product that is special and unique for your treasured memories. Our favorite service is a photo slideshow & video montage. This custom work does not follow a formula and, as a result, is as difficult to quantitatively measure as are your memories. While it involves a great deal of technology, it is art. It is created just for you, and, to our knowledge, is unlike anything our competition does. Our custom slideshows are a popular feature for a tribute video, such as a graduation, wedding, anniversary, birthday or a funeral. We can also create video yearbooks for your organization for fundraiser sales or for banquet entertainment. Our freelance work has been used internationally by photographers showcasing their client portraits as well as by small businesses desiring web video advertisements or e-greeting cards. Watching a custom photo montage from Multimedia Memories is a completely different experience than watching a simple slideshow with background music. Not only will your pictures move, they are not limited to moving in a straight line or even at a constant speed. And one picture alone can have multiple focal points. For example, high resolution photos that capture a variety of people can enhance the story by showing only a person’s reaction before revealing what he is reacting to. Sweeping vistas can be explored in ways that seem to draw the viewer in. Video can be edited, trimmed, or split down to the precise frame. Effects can be added with the same precision, so that, for example, a vignette can close around the focal point in perfect time to the music. 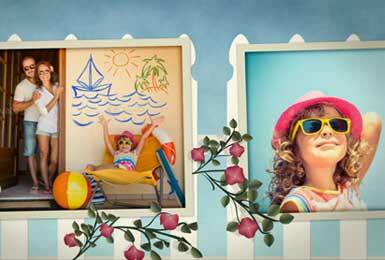 For an extra special touch, consider a motion collage, including 3-D collage effects. You video scrapbook might assemble itself in time to music. A papercraft world can come to life. Photos might fall, twist, twirl, bounce, spring, be sketched in or appear from ink drops. Framed photographs can hang from a tree or on any wall you imagine. The possibilities are limitless.